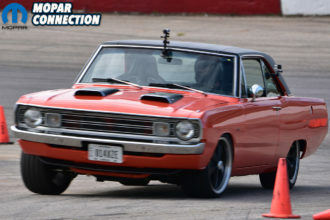 Fred Suydam’s 1968 Dodge Dart is an exceedingly unique base model vehicle. 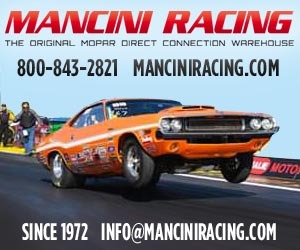 Many Mopar enthusiasts are familiar with the name of the national “White Hat Special” campaign that pertained to the 1968 hardtop Darts, and some may have even heard of the 1969 regional campaign called the “Western Sport Special” directed to various west coast Darts churned out by Dodge. 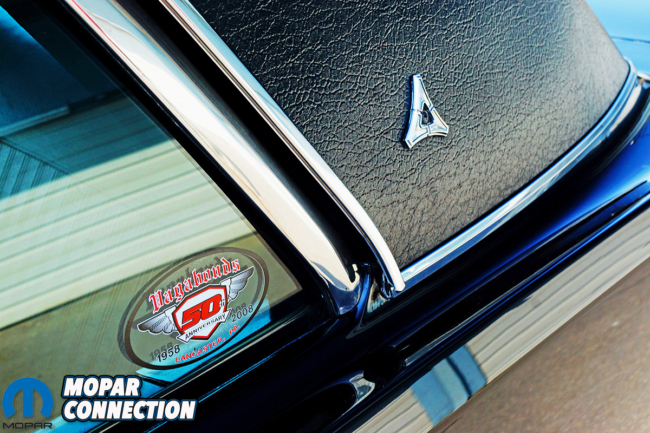 However, it is rare to know a person that has heard of the regional “Sports Special” series applied to the LL21 1968 Dart sedans. The production of the Sports Special occurred only at the Los Angeles assembly plant for the 1967 and 1968 model years. Fred’s Dart, manufactured on April 18, 1968 at the LA assembly plant, started out as a medium tan metallic ride with a white vinyl top, tan interior, vinyl bench seats, a 225 Slant Six and a 904 TorqueFlite transmission. The rear end was a 7 ¼” with the standard 2.76:1 gears, and the optional 7.00×13” white side wall tires on stamped steel wheels. The brakes were composed of a dual reservoir master cylinder that applied the hydraulics to four manual drum brakes. Above: The gleaming chrome can be seen around the door window frame, the side rear window, on the rocker panels, the wheel openings, and the drip rails on the rare Sports Special that was only offered in 1967 and 1968. The original purchaser opted for air conditioning, which required tinted glass for all the windows. The “Sports Special” option, which not only included the exterior color, interior color, and vinyl top previously mentioned, included carpet (front and rear), drip rail moldings, body side moldings, upper doorframe and quarter window moldings, body sill moldings, wheel lip moldings, and deluxe wheel covers. 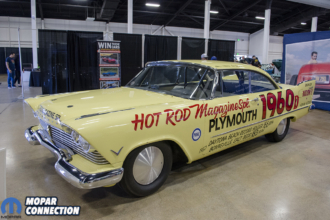 Fred acquired the Dart in 2014 at the Spring Carlisle event. He had no intentions of purchasing a car that day, but rather he was in search of an interesting hood ornament for his grandson. While rummaging through the various ornaments of the swap meet, he could make out in the distance, over the rolling hills at the fairgrounds, what looked like a black Dart. Fred continued to rummage through the endless swap meet booths, but his attention increasingly returned to the Dart. Top: The 360 is equipped with shorty headers to help rid the engines of spent fuel. Bottom Left: The dash pad is in flawless condition. A Sun Pro tachometer monitors the critical crankshaft RPM. 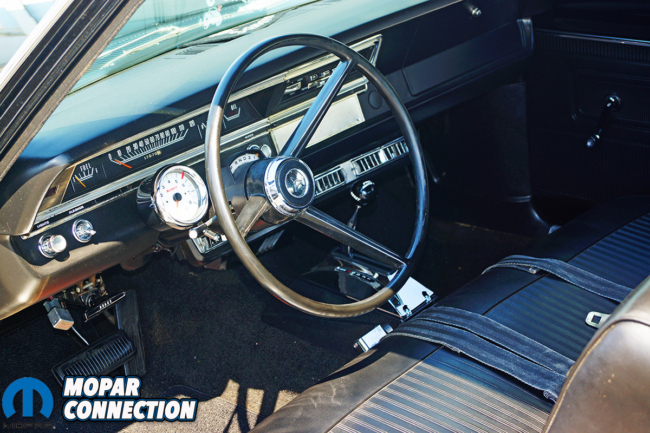 Although the gear selection is currently handled by a floor shifter, the automatic gear selector quadrant remains located on the steering column sans the shifter lever. Bottom Right: A pair of Cooper 165R15 tires ride on a pair of Draglites. 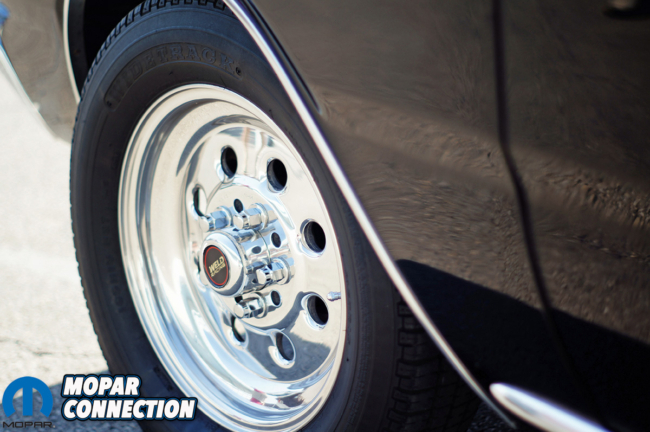 The front wheels hide a pair of ’73 Dart front discs that replaced a pair of barely adequate front drums. Eventually, his curiosity got the better of him, and he meandered in the direction of the Dart until he found himself standing in front of this beautiful 1968 Dart sedan. 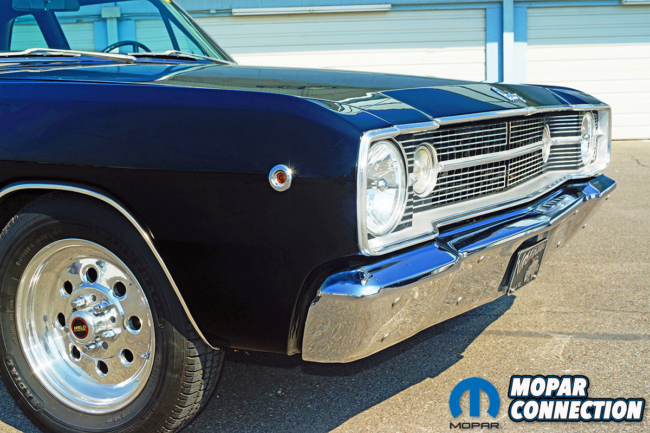 The black paint was flawless, and the matching black interior looked nicely restored. The slant six was long gone and in its place was a V8 attached to a Torqueflite. The seller was a man from New York, and he mentioned he purchased the Dart from one of his friends that lived in Arizona. Apparently, the Arizona owner had purchased the Dart to cut it up and transform it into a drag strip terror, but once he noticed how nice the body was, the Dart was spared the knife. 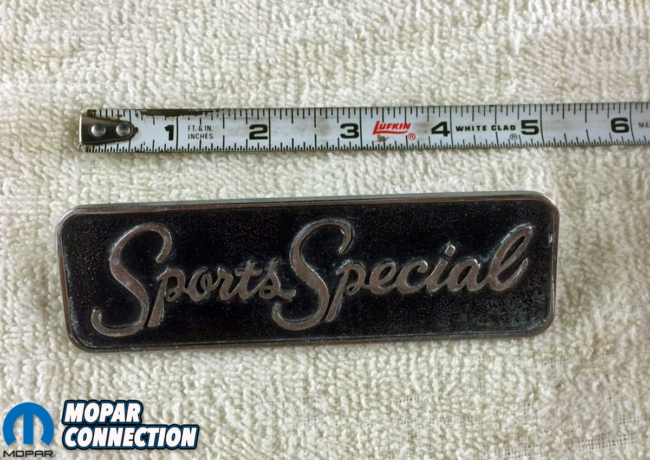 Above: The extremely unique Sports Special badge was approximately 5 ½” X 2”. Fred has elected to not reinstall the badges, but had he decided to do so, the proper placement for the badges would be on the front fender behind the front wheel. The straight black lines on the body, a V8, and the lesser-known sedan body style impressed Fred. The sales transaction took a few days to finalize, and upon completion, Fred now owned a super clean Dart. In the winter of 2014, Fred pulled the 360 engine and TorqueFlite for a thorough rebuilding. The 360 spins a cast crank swinging factory rods that move pump-gas friendly hypereutectic pistons up and down the holes. 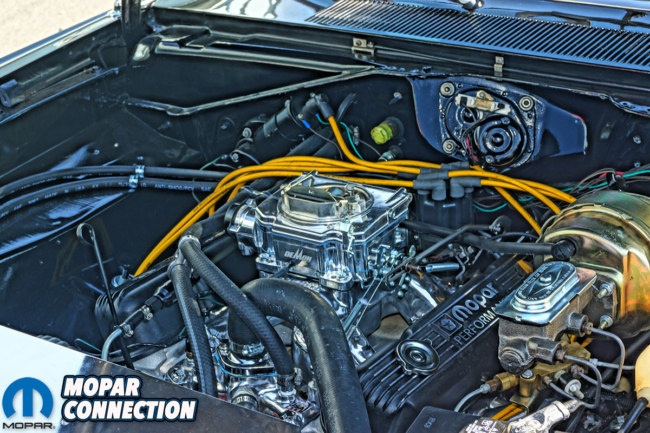 Atop the block is a pair of aluminum Edelbrock Performer heads and an Edelbrock intake manifold topped with a Demon four-barrel carburetor. Fred did not disclose much information about the selected Competition Cams camshaft profile, but it does provide a nice lope and rumble when the Dart inches by the unsuspecting public. Fred added a shift kit to the TorqueFlite during the rebuild. 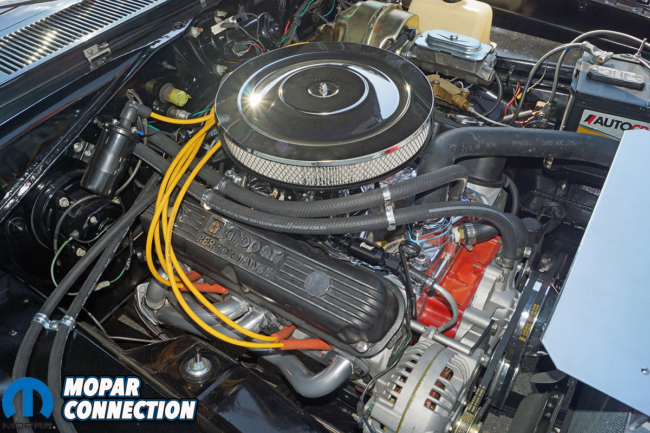 The new camshaft’s increased RPM torque peak required a better torque converter selection, so Fred slipped a slightly looser torque converter in place of the previous converter. To complete the driveline, Fred rebuilt and installed a 3.23:1 sure-gripped center section into the 8 ¾” differential. Top Left: To meet the new federally mandated requirement of light indicators on the side of the all vehicles for 1968, Dodge installed a red tinted round side marker light at the rear most area of each quarter panel and placed an amber colored side marker light on each front fender before the front wheel opening. Top Right: The warmed over 360 now supports Edelbrock Performance RPM heads as well as their Air-Gap intake. Bottom Left: The vinyl top was replaced when the Dart was repainted, and the original trim and emblems were reinstalled during the restoration. Bottom Right: The contrast between the sparkle of the chrome and the unbelievable depth of the black basecoat/clear coat is very appealing to the eye. Over the next few years, Fred freshened up the vintage front disc brakes and installed new shoe linings and wheel cylinders on the 11” drums on the 8 ¾”. 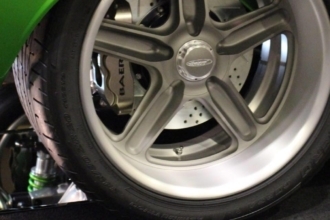 In the front Fred mounted a pair of 15”x4” Weld Wheels wrapped by 165R15 Cooper tires, and torqued them onto the big-bolt pattern rotors. 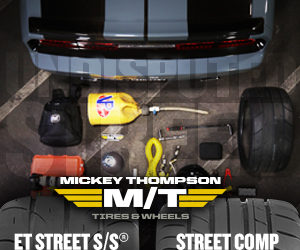 A complementary pair of rear wheel big-bolt pattern 15”x7” Weld Wheels cloaked by a pair of 235/70R15 Cooper tires rounded out the rolling stock. When it came to the body of the Dart, Fred inspected the body and chassis stem to stern for patch panels or areas of post assembly line work, and could not find any evidence of any rust or repair. 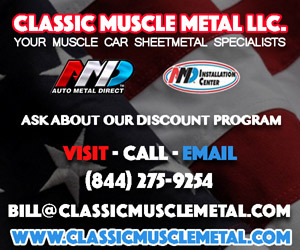 To double check, Fred moved a small magnet along the body with a great focus in the typical areas that would have had rust damage and subsequently filler from the repair. Again, he found nothing. Satisfied with the quality of the bodywork and paint, Fred just did a detailed washing of the exterior and provided a good polishing of the paint and chrome. 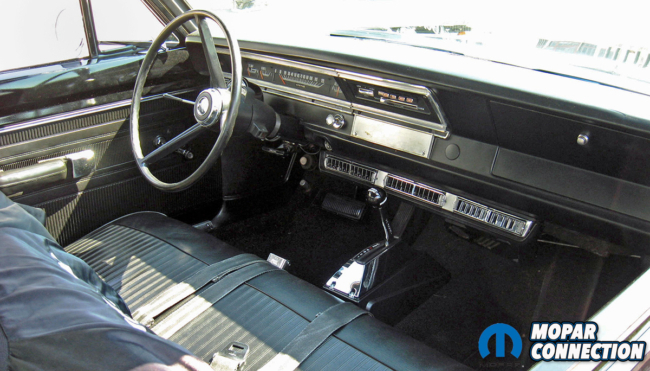 Top: You can see the radio delete panel and performance floor shifter that was installed prior to Fred’s purchase. Bottom Left: The round turn signals in the front grill easily confirms the 1968 model year. 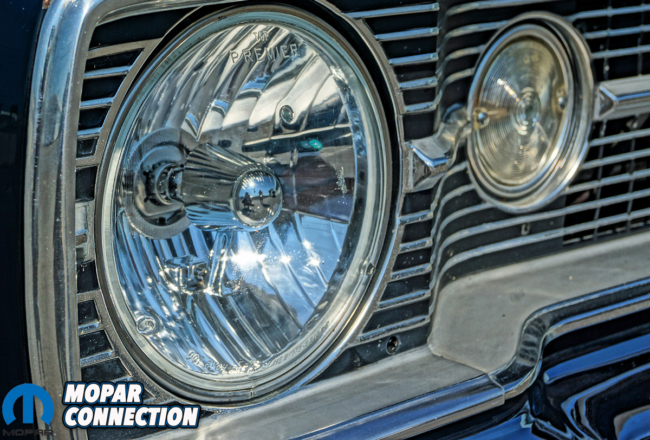 The original headlamps were replaced with brighter aftermarket lights for better visibility. Bottom Right: By the looks you would think the taillight bezels and side marker lamp were replaced but they haven’t. A good polish and they shine like they were new. Fred has two objectives upon which to focus in the future. First, Fred’s Dart originally came with air conditioning (AC), and he wants to restore AC to the Dart. He is not a fan of the original large V-twin compressor, so he is investigating the installation of an aftermarket Sanden compressor. A Sanden compressor is smaller for better fitment in the engine bay, and it operates with more efficiency (does not consume as much horsepower to operate), which will reduce the load and idle speed fluctuations on the engine. The second objective is to remove the radio delete plate and install a period correct radio (original appearance but fitted with modern options). 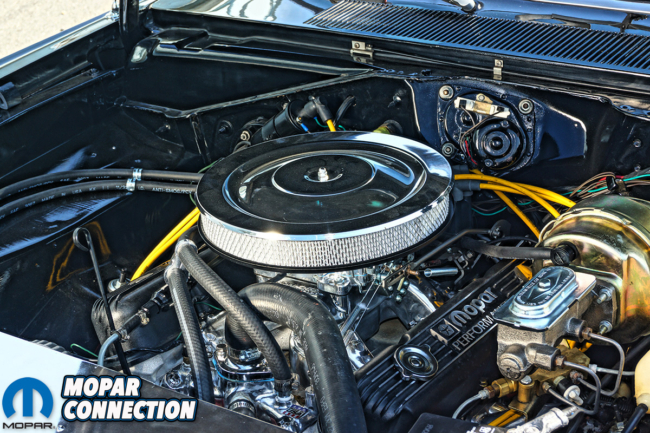 A previous owner installed all the wiring and the radio antenna, so the installation of the radio should be a straight forward affair for Fred. Above: It’s hard to imagine that Fred’s car started life as a medium tan metallic exterior, a white vinyl top, a tan interior and a slant six motor. 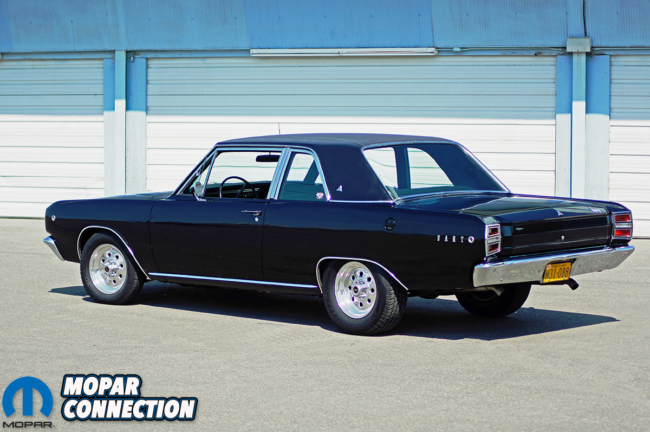 We agree the upgrades and color choice really makes this little Dart stand out. 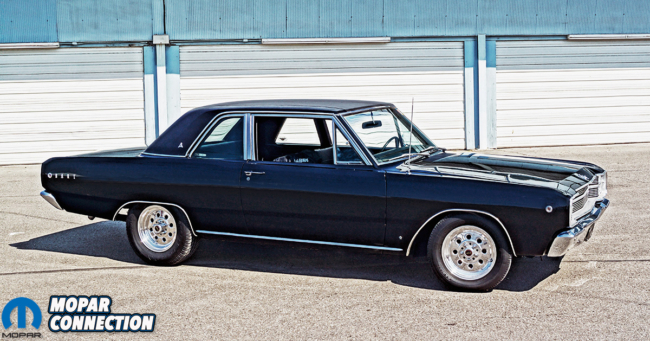 The two-door Dart sedan has often been overlooked for the sexier two-door hardtop, and even Fred’s wife refers to his Dart sedan as “Black Ugly”. For those not familiar with the central Pennsylvania area, Amish and Mennonite farms speckle the landscape, and Fred lives right in the thick of the Amish population in Lancaster County, PA. To celebrate the population and poke some fun at Fred, his wife got him a magnetic bumper sticker that reads “My other car is” followed by a picture of an Amish buggy. While the Amish ride in their buggies, the Mennonite population drive vehicles that are very basic and usually black in color. The truth is the Mennonites prefer a vehicle with no chrome; they do not want to attract any attention. That is where Fred’s sedan differs. While it may be black, it is less than sedate with the large amount of gleaming chrome. 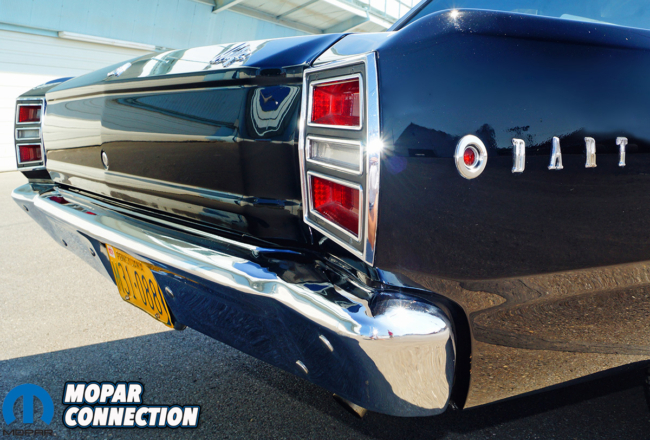 All that chrome makes Fred’s Dart sedan very special; a true Sports Special Sedan.